Click on the image for link to club Face Book site. Once again this year the Rocky Mountain Railroad Historical Foundation is providing up to five $1000. grants to aid in the preservation and educational advancement of rail history. Please click GRANT APPLICATION to download a PDF of the RFP insturctions, due dates, and requirements. CLICK EVENTS to see a calender of our upcoming activities. Our Events page has other activities happing in the region. The Rocky Mountain Railroad Historical Foundation winners are listed in the June issue of the Rail Report and the Foundation page. In 1964 Trains Magazine dedicated their 8 page Photo Section to the 25th anniversary of the club. Click on Trains 25th Anniversary Article to view this article. It is best viewed as a two sided display. This site contains information about the Rocky Mountain Railroad Club, railroad history, stories of historic Colorado railroad cars, late breaking train news for rail fans. The preservation of rail history includes the memories and stories of the early railroaders who build and operated the railroads of Colorado. Personnel stories and histories submitted to us are part of Rail Reports page Personal Histories. 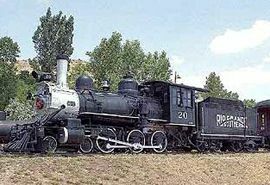 Number 20, acquired in 1952, is one piece of railroad equipment which the Rocky Mountain Railroad Club owned. On May 31, 2006 engine 20 was turned over to the CRRM Foundation ownership. An unnamed benefactor has provided funding to return the engine to operating condition. The restoration is being performed in Strasbourg PA. The Rocky Mountain Railroad Historical Foundation was founded in 1990 by the Rocky Mountain Railroad Club for the purpose of restoring historic railroad equipment. For many years our main project was the restoration of Denver and Intermountain No. 25 (the only totally intact, surviving car of Denver's once vast electric railway system). Car 25 was added to the National Register on January 12, 2012. The foundation page details how this piece of Colorado history was saved from the scrapper. No. 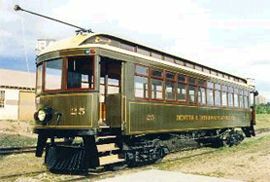 25 was one of seven cars that provided passenger service between downtown Denver and Golden over the Denver Tramway Company's 13 mile standard gauge line. A history of No. 25 can be found by visiting the Foundation page. This site is the result of the enormous contributions of the members of the Rocky Mountain Railroad Club. All railroad photography and writing contributed for this project are used with much appreciation. All train photos and train text, copyright 2000 - 2018 Rocky Mountain Railroad Club.